Warmism: Credible Politics, Incredible Science | Watts Up With That? The greenhouse effect is a process by which thermal radiation from a planetary surface is absorbed by atmospheric greenhouse gases, and is re-radiated in all directions. Since part of this re-radiation is back towards the surface and the lower atmosphere, it results in an elevation of the average surface temperature above what it would be in the absence of the gases. Solar radiation at the frequencies of visible light largely passes through the atmosphere to warm the planetary surface, which then emits this energy at the lower frequencies of infrared thermal radiation. Infrared radiation is absorbed by greenhouse gases, which in turn re-radiate much of the energy to the surface and lower atmosphere. This greenhouse effect forms the basis for warmist doctrine: that human CO2 emissions are causing a catastrophic increase in the global average temperature. Although people like Gaia theorist James Lovelock have predicted that global warming will kill billions of humans the belief that warming would be catastrophic for life on earth is largely unresearched and probably indefensible. There have been many extended warm periods in the earth’s history and the fossil records we have for them suggest that each produced more life, and a greater diversity of life, than the cooler periods preceeding them. We have reasonable information, furthermore, on the Roman and Medieval warm periods and not only did each of these kick off significant civilizational development, but the polar bear made it through them embarrassingly undead and not a single estuarial or river basin culture, whether in Asia, Egypt, or Europe, is known to have drowned. The Wikipedia article quoted above gives the two main facts warmism depends on: gases tend to emit heat at a lower frequency than they absorb it, and measured net solar radiation does not fully account for near surface air temperatures – but doesn’t directly raise the problem that the measured effect is roughly an order of magnitude too large to be accounted for by the known interactions between thermal radiation and atmospheric greenhouse gases other than water vapor. This problem has produced a widespread search for a forcing multiplier – something which reacts to a small increase in atmospheric CO2 to force a big increase in atmospheric warming. So far, however, none of the candidates for this have withstood even friendly critical review – meaning that those who argue for CO2 as a primary source of a significant atmospheric greenhouse effect are committing themselves to the biggest magical hand wave since crystalline epicycles brought consensus to the Ptolemaic Universe. The biggest “experiment” on this is, of course, reality: CO2 concentrations appear to have gone up by more than 20% since 1958, but we have neither a clear definition of the average global surface temperature nor data to support the belief that any of the proxies we have for it have shown significant change over the period. The smallest and most often repeated experimental demonstration, the Al Gore tabletop special in which one jar contains a bit more CO2 than the other, produces essentially the same result if the same weight of an inert gas like argon is used in place of the CO2. It is easy to demonstrate the greenhouse effect by pointing a thermal imaging camera at the sky, but within the limits of Google and Bing searches it appears that no one mapping variations in the effect to variations in local concentrations of greenhouse gases other than water vapor and urban smog has demonstrated effects beyond the levels (roughly one tenth of the IPCC climate sensitivity assumptions) predicted by the theoretical calculation with no multiplier. What we know of the earth’s climate history does not support the warmist indictment against anthropogenic CO2 emissions either: none of the warming periods recorded in human history can have been triggered by human CO2 production – and the longer term geological record seems directly contradictory too. Essentially all of the earth’s surface has been tropical at one time and glaciated at another, but nearly all of the information we have about the atmosphere during those periods suggests that CO2 concentrations rose during, but not before, tropical periods and fell significantly during, but not before, glaciations. What we can say therefore about the belief that atmospheric CO2 increases are causing significant global warming is that it has no theoretical support, no experimental support, cannot be seen operating in the real world, and is contradicted by what we know of global climate history. Where neither science nor history can explain warmism, politics can. Basically, if you’re someone like Al Gore whose political career is based on railing against American republicans, then an obvious reason for singling out CO2 as a threat to humanity’s future is that this is an easy sell: there is a grain of truth in the science, people can see smokestacks, the SUV is a widely approved target for angry rhetoric, and the political audience is generally eager to accept the burdens a demonstrated need to control national energy use would put on them. Similarly, what we can say about the idea that global warming would necessarily prove net negative for life on earth is simply that this idea has not been extensively studied but seems to have neither theoretical nor experimental support and is contradicted by what we know about the history of life on earth, but meets the political need for players like Gore et al because people cannot be held hostage to the threat of a good thing happening if they don’t knuckle under. It is important in forming personal beliefs about the relative roles of science and politics in warmism that we separate belief from reality: most of the alarmists seem to be true believers, most of the deniers merely Missouri skeptics, but there seems to be no objective evidence to suggest that either side genuinely knows whether the global climate is changing or not. Thus we can probably agree that the publicity now generally given a hot day in Death Valley and denied an extended cold emergency in Peru reflects an editorial agenda more than it does climate, but the combination of theory, data, and definitions we have is not sufficient to let us know whether either fell outside longer term climate norms. The deeper issue here is not that the political action now strangling western economies is politically motivated, but that accepting the arguments for seeing warmism as sheer political fraud means accepting that the talking heads citing science to sell it to the masses are either deluded or dishonest – but because no wolf today doesn’t mean no wolf tomorrow, it also means that warmist politicization of the research process has to be seen as having destroyed the credibility of all involved, and thus as having greatly weakened the world’s ability to recognize and respond to a real threat should one now materialize. Paul Murphy, a Canadian, wrote and published The Unix Guide to Defenestration. Murphy is a 25-year veteran of the I.T. consulting industry, specializing in Unix and Unix-related management issues. This essay was originally written for consideration of the Matt Ridley prize. Thank you; if this entry doesn’t win, I must read the winning essay; it must be a show-stopper. I agree, some persons see smokestacks; a few of these may see smokestacks belching un-filtered combustion products [nearly none in North America nor in Europe]; nearly all such sightings are steam and other water phases. Thermal pollution is an other problem. You’re slowly coming around Anthony. We’ve won the science battle now we must win the political battle. Fortunately our opponents, like AL Gore, aren’t very good politicians. Although people like Gaia theorist James Lovelock have predicted that global warming will kill billions of humans the belief that warming would be catastrophic for life on earth is largely unresearched and probably indefensible. I’d give it a prize! A fine essay – succinct, thoughtful, civil, informative, and with a sting in the tail of it. This states the deepest problem the Warmist position and tactics bring. If the world ever has to address a real climate problem, our ability to mobilize a real response is deeply degraded by the AGW hysteria of the 90’s and oughts, which followed the “Coming Ice Age” hysteria of the 70’s. Uh huh. As a former student of Physical Geography and Geology, I came to this conclusion 10 years ago after trying very hard to find out what “proof” the climate scientists had to support this theory. All I ever found were computer models supporting other computer models, all of them making the same assumptions. Then I tried to find out who the 97 percent of scientists were that supported the theory. That claim also just sort of evaporated. I assumed 10 years ago that the whole thing would just collapse for lack of any credibility. However, I didn’t count upon the persistence of moneyed interests to keep the lie going, nor upon the gullibility of the general public, and the fact that people just don’t have the time to investigate these things for themselves. And this is the way “greenhouses” work? Some canonical definition that is. More like a canonical twisting of the way that greenhouses work. As we know, they work by inhibiting vertical mixing. Bah. If you ever want to see a confused AGW moonbat, ask them to explain why greenhouses stay warm. Straightforward enough essay. Its theme is spot on – the Gaia cult is a theology of animosity towards science and the human. As with lizards jumping from trees and turning into birds there is not a single iota of rational investigation nor proof involved. The article is correct in that no science, historical data, nor common sense supports the human-hating cult of warm. Only politics, money, ignorance and anti-humanist bile drives it onward. OK, short history, I’m 75, spent time in Vietnam (I-Corps) and Laos, came out knowing we almost used nukes because of the huge troop and supply operations from North Vietnam to the south and that resulting in lots of our kids being killed. So, joined GreenPeace with hopes of slowing the spread of nukes. End was at a Greenpeace meeting in Portland Or. where I was asked to leave the meeting and told “If you know what is good for you do not come back.”. It being I was calling out the connections to what I still call the “commie loon influence in the Greenpeace leadership” . All this global warming, climate change, “con” , “fraud” is the work of commie loons and the Democart Party and its lust for power in conjunction with world wide commies. Lies, on lies from liars enabled by paid liars like Michael Mann. The president believes differently and has, by executive order, established new political committees to stop climate change in its tracks, I hear. One minor quibble with wording Pat. I would suggest not referring to undead polar bears. That brings to mind zombie or vampire polar bears. The main visible action of the President’s recent Executive Order is to build a website. This from a guy whose demosntrated capability to get a large website up and running is now the punch line of jokes around the world. And he calls skeptics ‘flat earthers’. I hope we have free historians and freely available records in the future for the historians to study. If so, the 8 years this President has inflicted on American and the world will be a focus of ridicule and amazement at how a free people tolerated the sort of banna republic kleptocratic arrogance being inflicted on them by this Administration. Yup exactly. Worse still is the denialism. Deny people are losing insurance due to Obamacare. Deny they are lying or have lied. C02 is Toxic! Climate Change must be stopped! Obamacare is Awesome! The site is working perfectly. Sow the Wind, Reap the Whirl-wind – is all I can say. Their day is surely coming. I know they don’t teach anything that does not support the cause anymore in school, but you should note the verb. Its indicates a past action in a perfective aspect. As such, this is a true statement. If the article had used ” … is predicting … ” or even ” … has been predicting … ” you might have a point. Other than his bald assertion, he doesn’t give a single reference, citation, or backup for his claim that the “measured effect is roughly an order of magnitude too large” to be explained by the greenhouse effect. Folks, this kind of “science by assertion” isn’t science in any sense of the word. Which “measured effect” is he speaking of? Who measured it? Where was it measured? How did he determine that it is an order of magnitude too large? Which “known interactions” is he looking at? These questions and a lot more would need to be answered before this even got into the ambit of science, much less became a scientific claim. In addition, it’s clear from the author’s claims that he doesn’t grasp how the greenhouse effect actually works. For those interested, see my posts called “The Steel Greenhouse” and “People Living In Glass Planets” for an explanation of the mechanism involved. I’d give this post a D-. It is nothing but an emotional appeal based on unreferenced, unsubstantiated claims. PS—The claim that “gases tend to [sic] emit heat at a lower frequency than they absorb it” is meaningless technobabble. They “tend to”? What, they have a decision? The frequency of the radiation emitted by gases is based solely and entirely on their temperature, there is no “tend to” involved. why does the IR wave leave the earth? what direction is it moving as it leaves the earth and why does it move that way? it leaves the earth because the earths surface is warmer than space and heat energy moves from its source towards colder bodies and space is very cold…..so the NATURAL movement of that IR wave is towards space, once it get grabbed for less than a second by co2 and then released there is NO FORCE applied to it so it will continue it natural path towards space….those claiming that most of it goes back towards earth NEED to explain what FORCE co2 applies that overcomes the natural thermodynamics please????????? also MOST of the IR wave is NOT impacted by co2 at all, and again the 3 tiny segments that are have only a moments slowing of their movement as the cos releases it in less than a second……..
also every bit of heat the co2 grabs for less than a second was already IN the atmosphere and clearly co2 ADDS NO HEAT at all to the system. to claim a greenhouse causes WARMING, means if you put hot coffee in a Styrofoam cup he coffee inside will get HOTTER! that is the claim being made, that insulation INCREASES the heat in the system and it DOES NOT! Nice essay, for me the basic problem, politically for the warmist, is they lie. They make no bones about their willingness to lie to further the cause. This is called shooting your own feet off. As the Canadian Liberals learnt, the US Democrats are learning, short term lying works, long term you destroy your goals. Lovelock was correct with that prediction, except for the scale of the tragedy. So far, the deaths attributed to attempts to mitigate Global Warming only number in the hundreds of thousands. However, with Obama pulling out the stops on the statists’ latest efforts against us, Lovelock may yet be vindicated. While I would agree with many of Pauls comments about the science, I would have to take issue with his concluding remarks. I do not believe that the political self destruction of the Professional Left will in any way detract from our ability to deal with real threats, terrestrial or otherwise. I believe the reverse to be true, and that shaming and publicly side lining all who sought to promote or profit by the AGW inanity will benifit our society immediately, as well as setting a valuable example for future generations. Bill Taylor, wrong on so many levels. Heat energy moves from its source towards colder bodies if you are talking about conduction. Radiation is completely different. Photons are massless – therefore no force is required to change direction. The levels of ignorance are multi-dimensional and diverse, crossing all educational, income, and professional ranks. The stench of ignorance has settled like Chinese toxic smog over our country, as various constituents have chosen comforting ignorance over disconcerting knowledge. The highly educated members, who constitute the ruling class in this country, purposefully ignore facts and truth because the retention and enhancement of their wealth and power are dependent upon them not understanding what they clearly have the knowledge to understand. The underclass wallow in their ignorance as their life choices, absence of concern for marriage or parenting, lack of interest in educating themselves, and hiding behind the cross of victimhood and blaming others for their own failings. Everyone is born ignorant and the path to awareness and knowledge is found in reading books. Rich and poor alike are free to read and educate themselves. The government, union teachers, and a village are not necessary to attain knowledge. It requires hard work and clinging to your willful ignorance to remain stupid. The youth of the country consume themselves in techno-narcissistic triviality, barely looking up from their iGadgets long enough to make eye contact with other human beings. The toxic combination of government delivered public education, dumbed down socially engineered curriculum, taught by uninspired intellectually average union controlled teachers, to distracted, unmotivated, latchkey kids, has produced a generation of young people ignorant about history, basic mathematical concepts, and the ability or interest to read and write. They have been taught to feel rather than think critically. They have been programmed to believe rather than question and explore. Slogans and memes have replaced knowledge and understanding. I know they don’t teach anything that does not support the cause anymore in school, but you should note the verb. Its indicates a past action in a perfective aspect. I know that some evidence of “cause” where none exists, and feel compelled to mount whatever attack they can muster in response to their misperception. In this instance of that phenomenon, said individual should note the entire sentence, not just one verb in a dependent clause. That dependent clause stands in support of an independent clause built upon a verb used in the present tense. This particular instance of that construction is illogical except in the case wherein the speaker believes that the circumstance described using the past tense perfective in the dependent clause is, in fact, an ongoing circumstance. This particular construction – referring to an ongoing circumstance by mentioning its point of initiation in the past perfect tense rather than using the progressive imperfective aspect – is quite common. An effective and respectful communicator acknowledges this, and responds to what was meant rather than embarking upon exercise in pedantry. Lovelock recanted. When a fellow mans up and admits he is wrong, he deserves to have that recognized. I don’t think I’m catching your point. Many people, especially those who read this site, are aware that the greenhouse effect is not the primary warming mechanism for real greenhouse, so the choice of terms is imperfect. Are you suggesting that warmists are unaware of this? I suspect some are, some are not. @Bill Taylor of the nine question marks at 9:51AM. I think the answer to your question is: weight!!!!!!!!!! CO2 is one of the heavier components of our atmosphere. It is by nature a ground-hugger, and needs a rigorous mixing to change it’s sneaky ways. And please note: ten exclamation marks. You’re welcome. 1) Your stuff is usually calm and sensible. Just a little over caffinated today, were we? 2) Nature doesn’t have many lasers – “tends to” was supposed to reflect spectra. Sorry. 3) if you want to attack wikipedia’s understanding of the greenhouse efffect, may I suggest starting with the water vapour on Venus problem? 4) if this essay were intended for Physics Today it would have sci-babble and refs, As it was I needed to meet Ridley’s audience and length limits -and so left out 99%+ of the argument. Very broadly I agree with you here except that this thing was written for a non science audience to make a political, not scientific, argument – hence sloppy. The ‘atmospheric greenhouse effect’ has not yet been demonstrated by anyone at all and it cannot be demonstrated to exist by using a thermal imaging camera. If such an effect did exist in the manner stated by Wiki, then it would necessarily be accumulative. The temperature would have been inexorably rising not since 1950 or some such date, but since the final decades of the 18th century. If there were a “greenhouse effect” then our energy problems would be over. We would have perpetual motion that could be used to perform work. “Solar radiation at the frequencies of visible light largely passes through the atmosphere to warm the planetary surface”. That is somewhat of a gloss over in the usual Wiki manner. They, and pretty well most others, fail to mention that that incoming sunlight consists of about 45% of EM in the infra red wavebands and that the heat potential of some of that radiation never gets anywhere near the surface in the first place..
Eloquent essay. Needs hardly any editing. Thank you, Paul. Yes Ken. Scroll down to butterfly graph. Even James Lovelock has said in an article printed by The Guardian that preventing warming might not be the best approach, but that we might be better off adjusting to a warmer climate. “Bill Taylor, wrong on so many levels. When are you going to be able to grasp the concept that “Radiation” is not heat, for crying out loud? Heat is kinetic energy. That is Thermodynamics. Radiation is electromagnetic energy. That is not Thermodynamics. Radiation has no temperature. It matters not, which direction radiation travels, only that it has sufficient flux density to increase the temperature of matter. If the matter in question is already as warm or warmer than the source of radiation in question no further warming can or will take place and the radiation is scattered. The above applies to you too Willis Eschenbach. The so called “Greenhouse Effect” is an hypothesis which has never been empirically demonstrated and therefore, does not “actually work” in ANY sense of the term “actually work”. Water vapour, the most powerful so called “GHG” for example, is pegged by the IPCC as a “strongly positive feedback mechanism”. However as those of us who live in Maritime climates are all well aware, water vapour is in-fact undeniably a strongly negative feedback mechanism. Your “Steel Greenhouse” pseudoscience has long been well and truly demolished. I just don’t get it, why is co2 any different to the earths surface where the longwave radiation goes straight upwards, if the co2 re-radiates why would it go down towards where it is coming up from. Could downward longwave radiation pass upwards going longwave radiation, seems a bit weird to me. And the rest. Bill, I’m a layman sceptic, too. But you must give the devil his due, or you will get mauled. There is a more-or-less continuous input of energy which starts (Sun) and ends/pauses (Earth) as heat, mediated by EM radiation. So your styrofoam cup is being fed new energy on a continuous basis: the question is how long it takes to escape. The insulation is purportedly being augmented, increasing the transit time for the escape. Arguing by analogy is dicey business, so be cautious, at the very least, to make the match as close as possible. There’s no support for the idea that *any* greenhouse gas, not just CO2, causes the planet to warm. Water vapor, for example, cools the planet by more than 20 degrees. It seems many answerers here don’t understand the greenhouse effect, yes it is real and warms our planet, but what is disputed is by how much, and because CO2’s warming effect logarithmically diminishes by concentration, how much more warming can, a doubling of 280ppm cause, IMO very little. Brain, not only is there is no experimental evidence that greenhouse gasses cause warming in the climate, it’s a demonstrated fact that they cool the planet. The Earth is over 20 degrees cooler than it otherwise would be because of the water vapor in the atmosphere. Take this water vapor out and the clouds go away, causing the temperature to rise dramatically. I hope you understand this because it’s key to seeing why AGW is bunk. The AGW theory *depends* on water vapor being produced by heating from CO2. It’s this extra water vapor that they claim will raise the temperatures to dangerous levels. But there is no evidence to support this claim. All evidence indicates water vapor causes overall cooling via cloud creation, not heating. 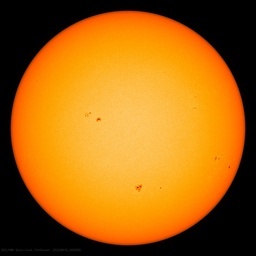 It seems many answerers here don’t understand the greenhouse effect, yes it is real and warms our planet, but what is disputed is by how much, and because CO2′s warming effect logarithmically diminishes by concentration, how much more warming can, a doubling of 280ppm cause, IMO very little. Please provide a link showing experimental evidence that greenhouse gasses cause the climate temperature to go up. I’ll give you a hint, you not going to find any papers supporting that idea with experiments. The reason you won’t is greenhouse gasses cool the planet, they don’t heat it. You can test this easily: Go stand under a cloud. Lasers? I said nothing about lasers that I recall … not clear what this means. give a single reference, citation, or backup for his claim that the “measured effect is roughly an order of magnitude too large” to be explained by the greenhouse effect. It seems you are operating under a misapprehension. WUWT is not a place where you can peddle uncited, unreferenced, unexplained claims and theories without someone saying “citations, please” or asking for references or data and code. I write for a non-science audience myself … but I cite and reference and explain my claims and provide data and code and required. That’s what distinguishes this site as a scientific site—folks insist on citations and references and data and code. The problem with your piece is that after all this, I still have no idea what underlies your claim that “the measured effect is roughly an order of magnitude too large to be accounted for by the known interactions between thermal radiation and atmospheric greenhouse gases other than water vapor”. So whether you are writing for a scientific or lay audience … it’s not working. See my questions above, all of which remain unanswered. Venus has its high temperatures due to atmospheric pressure, not the greenhouse effect. As atmospheric pressure goes up, temperature goes up too. There are online tools that you can use to calculate this pressure/temperature relationship, and if you do you’ll find they explain Venus’s temperature just fine. For exactly this reason Mars has a low temperature. While it’s atmosphere is nearly all greenhouse gasses, it’s pressure is very low. Again, use the online tools and you’ll get the right answer for Mars too. P.S. And just as a word of advice, *anything* that comes from James Hansen (such as the greenhouse effect causes Venus’s temperature) should be carefully checked. And just in case you doubt my statement that water vapor cools the planet, you can check it yourself. One way to do this is to calculate the amount of energy hitting the earth from the sun and use it to determine what the Earth’s temperature would be if it had no atmosphere. Then compare it to the actual temperature. A Harvard physicist named Lubos did this and got an answer of 24 degrees cooling. Another way to do it is to use the ISCCP cloud data and calculate the average temperature where there is 0% cloud cover and compare it to the average temperature of the Earth. I did this and got an answer of 24 degrees cooling. If you’d like to see my code, shoot me a request to magicjtv at gmail dot com and I’ll get it to you. A monopole aerial will transmit and receive EM frequencies of ‘1:1, 2:1, 4:1 and 8:1’ (full, half, quarter and eighth wavelength) frequencies without upsetting the ‘S.W.R’ (Standing Wave Ratio). IOW, it’s ‘resonant’ to these wave lengths. It’s only ‘reasonable’ to accept that ‘molecules’ react in a ‘very similar’ way. The little buggers are only ‘receivers and transmitters’ (absorbers and emitters) after all. It just depends on which part of the molecule’s ‘system’ you observe for the ‘absorption/emission’ wave length. A). Wave lengths slightly below these ‘resonant frequencies’ shall ‘detrain’ (reduce) energies at that ‘resonance’. B). Wave lengths slightly above these ‘resonant frequencies’ shall ‘improve’ (increase) energies at that ‘resonance’. FWIW, EM transmission is a ‘mixed bunch’ at best. However, I’ll go with ‘entropic decay’ and say that ‘yes’, the original statement is accurate “gases tend to [sic] emit heat at a lower frequency than they absorb it”. If it’s a scientific site why do you post non scientific articles about your life? Time to get out Willis’ shock collar again. ‘Greenhouse Effect’…is an unfortunate misnomer…the atmosphere moderates temperatures…it should be called the ‘Moderating Effect’…and we should be thankful for it. This is no mopre skepticism or heresy, it’s plain denial of physics. Are Planck and Stefan-Boltzman wrong (falsified or refuted)? Are absorption spectra of electromagnetic radiations delusions? It’s not bad to have such post from time to time. It helps setting some boundaries between phantasms and reason. Run the experiment a second time with a thin film of LDPE floating on the surface of each water sample, restricting evaporative cooling, and observe how different the results are. demonstrates the difference in the average temperature of a tall gas column, when heated and cooled at disparate locations at the base (non-radiative atmosphere) and heated at the base and cooled at altitude (radiative atmosphere). Think about this, for the same temperatures and flow rates through the heat exchanger tubes, which gas column runs hotter, and why? 1. Driving vertical tropospheric convective circulation, thereby producing the observed lapse rate, reducing average atmospheric temperatures. 2. Driving vertical tropospheric convective circulation, thereby increasing the speed of mechanical energy transport from the surface. 3. Emitting to space not just the energy the atmosphere absorbed by all frequencies of radiation, but all energy acquired from surface conduction and the release of latent heat. The bottom line is this, radiative gases are not the only heating method for our atmosphere, but they are the only effective cooling mechanism. The net effect of radiative gases is atmospheric cooling at all concentrations above 0.0ppm. Adding radiative gases to the atmosphere will not reduce the atmospheres radiative cooling ability. AGW is a physical impossibility. @Konrad: yes I still miss your point, for good reasons. Energy balance must come into play, and consideration must be given to the fact that the earth can only exchange energy with the outer space by mean of electromagnetic radiation (this is not the setup situation of the experiments that you describe). Over time the radiation received from the sun must be sent away, otherwise the temperature of the surface and of the atmosphere would never stop raising. The way of sending this energy back is reflection of the incoming light and radiation according to Planck’s law and Stefan Boltzmann equation. With no atmosphere there would be an equilibrium temperature somewhere between 0 K (perfect reflection, no black body) and 279 K (no reflection, all absorption and re-emission by Earth surface as a black body). With an albedo of 0.3 and an surface emissivity of 0.95 the equilibrium temperature would be 254.8 K (-18.4°C) (average over day-night). But the earth surface temperature is on average (if anything as an average temperature would exist) around 288 K (15 °C). So something has to have happened, and this is called atmosphere. The atmosphere is heated first by absorption of the incoming radiation by oxygen and nitrogen in the ultraviolet (UV) range. What has not been absorbed in the UV range or reflected away is absorbed by the earth surface, clouds, and aerosols. And then, for energy balance reasons, it must be irradiated back in the infrared range (IR). When a gas containing an IR absorbing substance is irradiated it will absorb energy, therefore, in absence of other heat exchange mechanism, it will heat itself adiabatically with a corresponding temperature increase. If the concentration of that substance (CO2, water vapour, methane or NOx, …) is higher, then more energy is absorbed, the temperature increases more. The temperature rise of the atmosphere will continue up to the point where the radiation toward the outer space (from what is called the “top of atmosphere”) will have increased by a quantity equivalent to what was trapped by absorption. A new temperature equilibrium establishes itself. This is the “primary forcing due to a change of IR absorbing substances in the atmosphere. Then other feedback mechanisms come into play: by the Planck law itself, water vapour, lapse rate, albedo, and clouds. Overall it is estimated that the sum of these feedbacks is negative, thus dampening the primary forcing. But this is another story, see http://bit.ly/GGZ1r2 . Murphy’s article is a fatally flawed debunking of the monumental fraud of AGW. To be sure, the AGW conjecture is backed by a lot of relative high grade science, but IPCC intersperses the science with nearly a dozen instances of bungled science that intentionally lead to its desired catastrophes. However, the existence of the misnamed greenhouse effect is not one of the bungles. 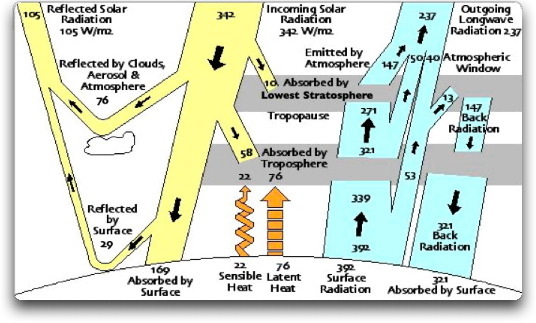 Thus, greenhouse gases trap heat* within the surface-troposphere system. This is called the greenhouse effect. AR4 Annexes, Glossary, p. 946. Solar radiation at the frequencies of visible light largely passes through the atmosphere to warm** the planetary surface, which then emits this*** energy at the lower frequencies**** of infrared thermal radiation. gases tend to emit heat at a lower frequency**** than they absorb it*****, and measured net solar radiation does not fully account for near surface air temperatures****** … . * Heat is energy in transit. It is no longer heat when the flow ceases. Heat cannot be trapped. ** Heat, not radiation, warms. Radiant heat warms, and radiant heat is the net radiation in both directions between objects. The primary heat to Earth is the difference between the Sun’s radiation and Earth’s puny return radiation, the NET radiation. The physics is simple. (1) Heat flows only from a warmer object to a cooler one. (2) Radiation flows both ways between objects. (3) Therefore, radiation is not heat. This is not nit-picking. Nor is it scientific pedantry, or trivia. The book “Slaying the Sky Dragon”, its authors, and its spin-off website, Principia Scientific International, are dedicated to debunking the greenhouse effect based on the unscientific equating of radiation and heat. *** What Earth absorbs and radiates to space is not “this” solar radiation. All bodies that have a temperature radiate. They radiate in all directions, that radiation intercepting all bodies that lie within the line of sight, whether warmer or cooler. Heat, though, flows only from the warmer object to the cooler object. The statistical atmosphere is cooler than the statistical surface, so for the purposes of climate, heat flows only from the surface to the atmosphere. Earth’s radiation comes from its surface thermal energy, most of which originally happens to have come in the exchange with the Sun. **** Radiation has color, a characteristic frequency pattern or spectrum, and as the source of the radiation increases, its spectrum shifts to higher frequencies, e.g., in the direction of IR toward UV. Heat is measured with a thermometer. It has no color, no frequency pattern. Because heat flows only from a warmer to a cooler object, radiant heat is always from a higher frequency source to a lower frequency source. That includes the Sun to Earth and Earth’s surface to the atmosphere. Heat is always warming. Absorbed radiation always has the uncertain effect of either warming, or cooling, or neither. ***** Physics identifies four modes of heat transfer: conduction, convection, radiation, and evaporation, but not absorption. Gases absorb radiation, not heat, and in proportion to the product of the incident radiation spectrum and the gas’s absorption spectrum. Gases emit radiation colored according to their temperature. The spectrum absorbed and the spectrum emitted will overlap so that at some colors the incoming radiation will be greater than the outgoing, the reverse holding at other colors. ****** Net solar radiation (heat from the Sun because it’s net) does not account “fully” for surface temperatures, not because the greenhouse model is wrong, but because the surface is simultaneously losing heat to outer space. That heat loss to space is moderated by the greenhouse effect. Whatever its name, and whether accounted for by the confusing back radiation model or the simpler blanket model, increasing the greenhouse effect reduces the heat loss to outer space, tending to increase the surface temperature, all other things being equal. CO2 has a significant absorption spectrum. The warmists got that much right enough for government work, but took at least three giant missteps from that point. (1) The amount that atmospheric CO2 radiation contributes to the greenhouse effect IPCC calculates as 3.71 W/m^2/ºC using Radiation Transfer in GCMs, and then averaging over a bunch of them. The contribution of GHGs cannot be reliably calculated that way. The global average Radiation Transfer is not the Radiation Transfer of some average atmosphere. And whatever atmospheric model yields the average Radiation Transfer is unknown. IPCC admits that this step is its largest source of error in estimating AGW. (3) The increase in temperature over the Industrial Era is due to two effects, the natural glacial cycle over the last half million years, and the recovery from the Little Ice Age. Not enough temperature increase remains for AGW to be scary, so IPCC zeros the natural temperature rises circa 1750, and then attributes all the subsequent natural rise to man. With these three bits of faux science, IPCC has (1) CO2 causing enough of a greenhouse effect, (2) CO2 emissions accumulating just fast enough, and (3) temperature rising just enough to ring the AGW alarm: man is upsetting Earth’s radiation balance. That upset is causing the surface temperature to rise to catastrophic proportions — not so fast that IPCC results can be validated, but not so distant that action can be deferred. The perfect calm. But wait! Another assumption lies just behind radiation balance. All other things are never equal. When Kiehl and Trenberth created their radiation budget in 1997, they showed how at the modern surface temperature, 288K (14.9ºC), radiation could be in balance simultaneously at the surface, at the top of the atmosphere, and in the middle. That was a budget, not a prediction. They did not show that those conditions were satisfied at any unique temperature. IPCC tacitly assumes that they did. (4) IPCC models climate as being drawn to a specific temperature, absent man’s contribution. In scientific terms, IPCC assumed the K&T temperature of 288K was a point of conditional stability. In fact, using K&T’s method, a radiation balance can be shown to exist at any temperature from absolute zero to at least 10K above the present value (0º to 15.9º C vs.14.9º C) just by letting humidity vary. Keeping AGW going is like any other program adopted by the socialist movement. Obliging people to do something they hadn’t done on their own requires an ever-expanding network of laws and arrests to counteract both the unintended consequences and the new ways free people invent to resist. Telling a scientific fib is analogous, and much like any other lie. Once begun, a seemingly unending number of lies must follow. AGW needs to be shot down, and the sooner that’s done, the better off the economy and everyone in it will be. But one cannot score a hit by shooting blanks. water vapor on Venus.. Hence the comment. I always love it when someone pops up to say that my claims have been “debunked” or “demolished” … but somehow they always fail to say exactly who “demolished” my claims, or where. Will, if you think that any of the science is incorrect that I’ve put forwards in my post entitled “The Steel Greenhouse“, I invite you to QUOTE MY EXACT WORDS FROM THAT POST that you disagree with, and tell us why you disagree. Because simply waving your hands and uttering the magic phrase “your pseudoscience has long been well and truly demolished” doesn’t make it so … as far as I know, no one has ever demonstrated that any of the things I said in that post were false or violated the laws of thermodynamics. Nice try at science by assertion, though. PS—We know the poorly-named “greenhouse effect” exists, inter alia, because of the satellite measurements of upwelling infrared (longwave) radiation. These clearly show that both the clouds and the “greenhouse gases” or GHGs (including water vapor) in the atmosphere absorb and re-radiate energy (the poorly-named “greenhouse effect”), with the net result being that the surface ends up warmer than it would be without the clouds and the GHGs. We also know the “greenhouse effect” exists because we can measure the downwelling infrared (longwave) radiation at the surface at night. Instead of finding just the radiation from outer space, about 3 W/m2 = almost absolute zero, we find that there is on the order of 300 W/m2 of downwelling radiation at night, and even more if there are clouds. Note that the blackbody (Stefan-Boltzmann) temperature of the downwelling radiation is at about 0°C. Does this radiation, which is right around freezing, “warm” the earth? Well … that’s only half a question. The full question is, do GHGs warm the earth compared to what? Because compared to having no GHGs, the earth ends up much warmer. This is due to having GHGs and clouds which absorb and then re-radiate the outgoing thermal infrared radiation both upwards and downwards. Without the downwelling radiation (~ 300 W/m2), the bitter cold of outer space would freeze the planet solid … so you can term that however you will. I say the planet with GHGs is much warmer than the planet would be without GHGs. Whoops. At 7:10 am, I wrote 3.71 W/m^2/ºC when it should have been 3.71 W/m^2 for a doubling of CO2. Apologies. my truth remains intact, NO insulator ADDS any heat to any system…..NO insulator traps heat…..slowing heat movement does NOT trap it and does NOT cause a build up of extra heat. May I offer you a response to Willis Eschenbach’s challenge? In order to maintain its thermal equilibrium*, the whole system must still radiate 235 W/m2 out to space. To do this, the steel shell must warm until it is radiating at 235 watts per square metre. Of course, since a shell has an inside and an outside, it will also radiate 235 watts inward to the planet. The planet is now being heated by 235 W/m2 of energy from the interior, and 235 W/m2 from the shell**. This will warm the planetary surface until it reaches a temperature of 470 watts per square metre. In vacuum conditions as described, this would be a perfect greenhouse***, with no losses of any kind. Figure 1 shows how it works. * Where is the thermal equilibrium? What is balancing with what? What he means here is Conservation of Energy. If the energy density at the surface of 6,371 km is 235 W/m^2, then at the shell, assuming “a few” means 3, it must be 234.78 W/m^2. Call it 235. ** The shell did not magically become a source of heat equivalent to his model for the interior of the Earth. If the shell is radiating at 235 W/m^2 and with emissivity 1, then it is at 253.7K (-19.4º C), just like the surface of his planet (close enough for .gov work). No heat will flow between the shell and the surface. The surface will not warm. Equivalently, the surface is warmed by conduction from the interior equivalent to 235 W/m^2, and radiates at that density. That outgoing radiation is about the same as the incoming radiation from the sphere. The net is 0. The surface will not be warmed by the shell. The radiation from the surface will not increase at all, much less to 470 K, the black body value for 301.7K (28.6º C). *** Eschenbach’s steel shell does not allow radiation to pass through it, absorbing some along the way, and with a temperature drop across its radial thickness. It does not emulate the effects of the gasses in Earth’s atmosphere, formerly called the Callendar Effect, which somebody along the way confused with a greenhouse. You can add Mr. Eschenbach to my little list of wannabe climatologists who confuse heat and radiation, and so fail to comprehend the Callendar Effect. Bill, the bad news is that a simple empirical experiment can prove you wrong. Take two chrome electric kettles and insulate the outer surface of one with bubble wrap and aluminium foil. Switch the power to both kettles on an off to simulate a diurnal cycle. One minute on, one minute off, for a few minutes. The water in the insulated kettle will reach the higher temperature. The good news is that CO2 is not an insulator. It acts to cool our atmosphere by radiation. Radiative gases in our atmosphere emit to space more than DOUBLE the the energy absorbed by incoming solar and the net flux from the surface combined. Take two chrome electric kettles and paint the outside of one with matt black paint to improve radiative cooling. Switch the power to both kettles on an off to simulate a diurnal cycle. One minute on, one minute off, for a few minutes. Now the water in the matt black kettle will have the lower temperature. I am well aware that the primary energy inputs to our planet are incoming solar radiation and internal geothermal, and the only outgoing energy flux is radiation. Nothing in my post above contradicts this. What I am arguing is that SB equations in the absence of fluid dynamics, are useless for determining the temperature of our moving fluid oceans and moving gaseous atmosphere. Applying SB equations to the question of radiative gases in the atmosphere by modelling the planet as a combined land/ocean/gas “thingy” without a diurnal cycle, the movement of fluids parametrised as constant fluxes and constantly fully illuminated with a ¼ power sun is junk science. To understand the role of radiative gases in our atmosphere, you need to consider land, ocean and atmosphere as separate and in the case of the ocean and atmosphere, mobile. The primary cooling mechanism for land is conduction to the atmosphere. The primary cooling mechanism for the ocean is evaporation into the atmosphere. The primary cooling mechanism for the atmosphere is radiation to space. The blackbody temperature of a combined land/ocean/gas “thingy” is irrelevant as we don’t live on one. The AGW hypothesis was first proposed as a problem concerning atmospheric temperatures. Empirical experiment shows that the net effect of radiative gases in our atmosphere is cooling at all concentrations above 0.0ppm. For a planet in where the outgoing radiation is equal to incoming radiation, very different land, ocean and atmospheric temperatures can exist depending on internal energy exchange below the top of the atmosphere. You seem to accept that changes in internal radiative fluxes can effect these temperatures, but ignore that changes in mechanical energy transport can also do this and that radiative gases play a critical role in governing the speed of convective circulation, a mechanical energy transport, below the tropopause. The AGW hypothesis does not just fail because water vapour feed back is negative, it fails because incident LWIR does not have the same effect over oceans as it does over land and critically, the speed of tropospheric convective circulation increases with increasing concentrations of radiative gases. Konrad have you tried that experiment? while the heat is on BOTH would reach the same temp…..when the heat is off the insulated pot would stay warm longer but when the heat comes back on they both will again heat to the same temp….also for the experiment to mimic our atmosphere, you need to send the heat THROUGH the insulation which would impede some of it going into the insulated one but would NOT impede the not insulated pot….remove the atmosphere from the earth and we would get HUGE temp swings between day and night……insulation only slows heat movement and nothing in your experiment shows it ADDING any heat to anything….the atmosphere tones down those wild swings by slowing the movement of the energy both incoming and outgoing, BUT again it does NOT add any heat. Maybe re-read my comment. I am saying that CO2 does not insulate. Like the black paint on the second version of the experiment, CO2 helps the radiative cooling of our atmosphere. I think it is a mistake to think of CO2 as an insulator since it works more like a reservoir in a store and forward mode. In that case then yes, an atmosphere containing it does trap heat for a time (latency). It is a continuous process similar to a lake except it is filled and drained by a very large number of molecules concurrently rather than by streams. This trapping action is not the same thing as conduction. And another thing re: other posts – when a molecule’s energy level is raised by absorbing IR radiation the direction in which that energy is later released is dependent upon shape of the molecule on a per-molecule basis, but one has to recognize that all molecules are spinning and gyrating madly and even a population of molecules that radiate asymmetrically will on average radiate equally in all directions. Nextly, when molecules do radiate they absolutely do not consult with their neighbors to see if the energy state of those molecules is higher or lower – they simply shed the excess energy in what ever directional pattern their geometry describes (CO2 is shaped a bit like an American football so one could presume individually they radiate asymmetrically) and in what ever direction is consistent with the orientation and geometry of the molecule. That means that radiation can strike an object that is at a higher energy level. It cannot be avoided. This effectively makes the entire population behave like an isotropic radiator. In the case of CO2 in our atmosphere, some of that radiation will hit the world. It is left to the characteristics of that object, in some cases, the world, to cope. The result is an increase in surface energy level leading to re-radiation and conduction into the atmosphere where the cycle may repeat. Some may go straight to space. dp and others ty for the civil tone of your responses…..doesnt the radiation process act as its own regulator meaning as it gets warmer the process of movement speeds up and when cooler the entire process slows down? Without going into a lot of Boltzman gymnastics and quantum math, the rate of exchange is related to the level of excitement in the radiating object. Other material properties play a role – space shuttle tiles will behave differently than will frozen CO2, for example, and phase changes affect specific curves of energy exchange ie the freezing point of water. By example, when designing the Voyager class of space explorers, specifically the energy budget in the RTG and waste heat radiator system, the engineers found they had to allow the heat to build up to a greater level on the spacecraft’s radiating surfaces in order to radiate all the excess heat to space without damaging critical systems (all heat radiates to space, eventually), there being no other means to shed excess energy. It was also important to design the shape of the radiators to prevent back radiation. Sound familiar? “This will warm the planetary surface until it reaches a temperature of 470 watts per square metre.”. ‘Temperature’ and ‘power’ are completely ‘incompatible’ metrics. The ‘quote’ is only worthy of diatribe as a form of response! Thanks for quoting and explaining, Jeff, much appreciated. By “thermal equilibrium” I mean steady-state. Immediately after a steel shell is added to the system, both the shell and the planet start to warm. After a while, however, they equilibrate and are no longer either warming or cooling, and thus are in steady-state, or what I termed “thermal equilibrium”. I don’t understand your objection to saying that for a first cut analysis, the area of the surface and the shell are equal. They only differ, as you point out, by a tenth of one percent. Since the nuclear core is producing 235 W/m2, the system will reach thermal equilibrium (steady state) when the shell is radiating 235 W/m2 to outer space. The shell will continue to warm until it reaches that level (235W/m2), and will warm no further. The part you seem to be missing is that at steady-state, the shell will also be radiating 235 W/m2 back to the planet. This is added to the 235 W/m2 produced by the nuclear core. Remember that the shell has twice the surface area as the sphere. As a result, at steady-state, the surface of the planet is radiating at 470 W/m2 over an area A, and the shell is radiating at 235 W/m2 over an area of 2A. I was not trying to emulate the earth. I was trying to emulate the poorly named “greenhouse effect”. This depends solely on outgoing radiation being absorbed, and then re-radiated, with half of it going out to space and half returning to the surface of the planet. It is immaterial whether the absorber is steel or gas. Confuse heat and radiation? Where have I done that? Heat is the NET energy flow between two objects. Radiation is the individual energy flow either emitted or absorbed by an object. See? No confusion at all. Finally, you accuse me of being a “wannabe climatologist”? The scientific journal Nature thought enough of my understanding of climate to peer-review and publish my “Communications Arising” about the climate … and you? Well, only sort of. Outer space is a hard vacuum, meaning there is very little “there” out “there”. A few hydrogen atoms running around (maybe one per cubic foot or so). The rest is empty, void, unpopulated, sans matter, etc. etc. Temperature is a measurement of the rate at which “things” vibrate. You know; atoms and molecules in various states; solid, liquid, gas, plasma. By definition with nothing (significant) there, outer space does not have a temperature. It is neither “cold” or “warm”. If you where foolish enough to put a thermistor in a vacuum chamber and pump it down and report that the temperature of the vacuum is (oh for example; about equal to room temperature) you would be mistakenly reporting the temperature of your thermistor in place of the non-existent temperature of the vacuum. Check with NASA, they have noticed that objects in outer space (Apollo capsules, Skylab, etc.) have a temperature, but the void of space does not. Really, its true. The very few molecules in the Thermosphere have high temperatures, but there are so few of them you couldn’t warm your coffee there by pausing on the way to the moon. The 2.3K “background temperature” is actually used to describe the approximate spectral shape of the background cosmic radiation. NOT the temperature of the void of space. It only describes the spectral shape of the radiation, not its “strength” or “magnitude”, etc. In fact, if you look in different directions you find more radiation coming in from some directions than others. You might want to look up a fellow by the name of Jansky, he figured most of this out a while back. And, he has a physical unit named in his honor. Talking about the temperature of a vacuum is about the same as discussing the “flavor” of a shape (my, that cube sure looks spicy), or the sound of a color (boy, that purple sure is shrill), or the length of a mass. Nice for a theatrics major, but hardly scientific. With all due respect Willis, you’re confusing individuals that want to learn by offering ‘impossible scenarios’. Power generation is 235w and the planet’s surface area (A) is 1m^2. There’s no problem with the planet, but the ‘shell’ displays a surface area ‘twice’ that of the planet (2A). Thus, when the shell emits 235W/m^2 its ‘power transmission’ is 235w times 2! That’s 470w! Do you see where this is going? Equilibrium is reached when the planet’s core is at absolute ‘zero’ and the W/m^2 for the shell is halved to 117.5w (117.5W/m^2). The level of energy transmission, per unit area, that the planet’s core is able to maintain at a rate of 235w. The good news is that CO2 is not an insulator. It acts to cool our atmosphere by radiation. In one [type], (10 torr) carbon dioxide of Mars is used as the insulating medium … . You are correct that CO2 does act to cool our atmosphere by radiation, but it doesn’t cool as much as not being there at all would. For this thought experiment, suppose that the CO2 were replaced with N2, which absorbs little LW radiation. suricat, 11/5/13, 5:49, points out Eschenbach’s error of quoting “a temperature of 470 Watts per square metre.” I was willing to cut him some slack on that as though we had developed an understanding and no longer needed to spell out “a temperature equivalent to a black body with emissivity 1 radiating at 470 W/m^2”. I think I knew what he meant, and there were more important fish to fry. Cold and warm are the same thing – concepts to describe the energy level that arrives by radiation. Space has only energy but in any particular point in space (not one which includes the surface of a nearby star) there is very little energy. Taken as a whole the energy of space is the background radiation level which is not very much. Space is considered cold (or hot) as a concept because there is very little background radiation energy, but hot/cold are not the best terms to describe the situation. A passive object set adrift in space will eventually assume the energy level of the background radiation level. Nature publishes any paper from anyone that meets the criterion at http://www.nature.com/nature/authors/gta/commsarising.html. Being published does not make you a scientist though it is certainly an honorable event. If citizen scientist is legitimized as a term then that is the best you and all of us can be considered but it is largely meaningless and without weight. I suspect nobody within academia would count you, me, or other non-credentialed science writers and so-called citizen scientists among their peers. Woe be to the peer system if it were any other way. It has enough problems as is. What comes from the sun must go away or we would be roasting. How: by the mechanisme given by Planck’s law and Stefan Boltzmann equation that, so far, have not been invalidated. The outer space is the only heat sink that is available. By the way: forget geothermal, with 0.082 W m-2 on average it is within the thickness of a splitted hair (0.024% of incoming sun radiation). But this too needs to escape to outer space. I read through the comments here and many just don’t understand even the most basic aspects of greenhouse gases, the atmosphere, or radiative transfers. Each says a few things correct but then turn around and make mistakes along the way. The two that seem to have it mostly correct are Willis Eschenbach and Konrad, both are very close but a bit incomplete. Konrad has proven experimentally that the greenhouse effect is real as Willis’s article claims. See his comment just above. Take Willis’s “Steel Planet” example, what throws many is his example ends up with the radiation density at the surface as 470 W/m², far too high. All Willis needs is to add is “window radiation” that does not interact with the shell (our atmosphere). That’s all. Let’s assume 40 W/m² is the window flux. Now that 40 goes directly through the shell to space without interaction and instead of 235 W/m² you just have 195 W/m² hitting the shell. Over time it equalizes and the shell radiates 195 outward plus the 40 is the same 235. But 195 also radiates downward making the surface equalize at 235 + 195 or 430 W/m². Still too high. So let’s try 75 W/m² of window radiation. In that case the shell equalizes at 235 – 75 or 160 W/m². The OLR is still 235 W/m² lost to space but now only 160 is radiated downward making the surface radiative density 235 + 160 or 395 W/m² and those figures ARE what the satellites and surface measures are reporting on the average (or close). See, it’s that portion of radiation at “window” frequencies that is so critical for it is really that portion that sets the surface temperature and according to Miskolczi’s research that factor is constant over the last some 60 years as co2 has been rising. Some might say, well 75 W/m² is not the correct window radiation from the surface, and that seems true to the many papers trying to quantify that amount. Closer to 40 T-F-K says, but they also includes 30 W/m² from the clouds and that is in all essence the same as window radiation from the surface but with a momentary stop at the cloud. What is important is that this radiation also leaves through the tropopause without further absorptions so that portion also does not press backwards down on the surface overall and that give his estimate as 70 W/m². There are some who do not even see the 160 W/m² from the inside of the shell actually warming the surface and that is actually correct, include me. What occurs is the downward impedes or is a two-way subtraction (could even view it as cancelling, as Poynting vectors, me also again) and the energy raising the 235 up to the 395 comes from the original energy source, for between the time of installing the shell until equilibrium is re-established the window is still occurring but very little is going through the shell allowing the radiative density at the surface to rise from the original 235 W/m² up to the 395 W/m² where everything balances again. Also this did not take into account any, if it exists, directionality or any allowance for the curvature which may be two tiny adjustments needed. Bottom line, Don’t forget the “Window Radiation” !! It is the one most important factor !! Let albedo be the variance. So yes, Willis’s “Steel Shelled Planet” works as expected if you allow a portion of radiation to bypass the shell. the answer to your thought experiment is very easy. As I have previously shown through empirical experiment, the surface of the planet would not be greatly cooler under a non radiative atmosphere. So what would happen if our atmosphere contained no radiative gases? 1. The atmosphere would still be conductively heated by the surface. 2. Without radiative cooling of gases at altitude, tropospheric convective circulation in the Hadley, Ferrel and Polar cells would stall and the atmosphere would trend isothermal via gas conduction, with the bulk of the atmosphere (except for a near surface layer over land but not ocean) set by surface Tmax. 3. Atmospheric temperatures would then rise higher as stagnated poorly radiative gases such as N2 and O2 were subject to radiative super heating, just as they are in the thermosphere where molecular temperatures rise to hundreds of degrees. 4. Much of the atmosphere would then expand beyond the protection of the geomagnetic field and be swept into space by the solar wind. 5. Everyone’s breathing privileges would then be revoked. PS. There are no planets or moons in our solar system that have managed to retain an atmosphere without some radiative gases in the mix. Nowhere do I claim that the planet cools by any other mechanism other than IR radiation to space. Not at WUWT, not at Climate Etc., not at JoNova, not at Dr. spencers site or any other site. Nowhere. If you have evidence of me making such a claim then present the evidence. A slight clarification, the empirical experiment shown proves that the radiative physics behind Willis’ Steel Greenhouse is valid. However this does not prove that the net effect of radiative gases in our atmosphere is warming, in fact the six other experiments I have previously posted combined show that the net effect of radiative gases in our moving atmosphere is cooling at all concentrations above 0.0ppm. Konrad, oh I agree, no warming, net anyway. I think co2 will make next to zero net effect, that is why I included what Miskolczi discovered, the window is exactly as it was sixty years ago and since co2 has not affected it at all what slight warming came from something else, be it albedo changes, solar, both, it just was not co2 and Miskolczi lost his job with NASA over his research. OK, at least we have now this fixed. Now infrared absorption: aren’t water, CO2, CH4, etc showing absorption lines in the IR spectrum? At approx 15 °C the ground emits IR radiations into the atmosphere. When looking at the figure at http://bit.ly/1gqZxAJ where will the absorbed energy (difference between blue and red line) going to, if not in adiabatic heating of the gas (the atmosphere) containing the IR absorbing components? And if the concentration increases, the quantity of absorbed energy will also increase (a logarithmic dependency), and the temperature also. This is the forcing that is being addressed in the CO2 story (not the convective heat trapping taking place in a glasshouse). And it has some relevance to the climate story, although in my opinion way less than claimed by warmists. My problem was opening your discussion of the steel greenhouse with an appeal in good IPCC fashion to a problematic equilibrium when you could have used the solid principle of Conservation of Energy. In steady state, the energy emanating from the interior of your planet is the energy radiating to space from the exterior of the shell. Just to close on the idea, here’s the bookkeeping. The interior energy released is 235 W/m^2 times the area of the surface of the earth, 5.1006•10^8 km^2, which is 1.199•10^17 W. So the energy density radiated from the steel sphere is 1.1199•10^17 W/5.10545•10^8 km^2 = 234.78 W/m^2, adding 3 km to Earth’s radius for the shell radius. The part you seem to be missing is that at steady-state, the shell will also be radiating 235 W/m2 back to the planet. This is added to the 235 W/m2 produced by the nuclear core. [¶] Remember that the shell has twice the surface area as the sphere. As a result, at steady-state, the surface of the planet is radiating at 470 W/m2 over an area A, and the shell is radiating at 235 W/m2 over an area of 2A. The where is in your addition of antiparallel radiation to attain 470 W/m^2. Heat and power are scalars, so if your planet, warmed by its interior, were inside a shell actively heated from outside to radiate to the surface, then the interior and active shell heats would add at the surface. Radiation, though, is a vector. It has a sign. Your shell being passive doesn’t add heat, so the outgoing radiation at your planet’s surface is + 235 – 235 W/m^2 = 0. The energy lost by radiation from the surface is just replaced by the back radiation from the shell. This net radiation is the radiant heat. Your steel greenhouse is not a greenhouse (as that word is used for Earth’s atmosphere). It does not create a temperature drop from the planet surface to the outside surface of the shell, and for all practical purposes it does not change the OLR. Congratulations on having your letter to Nature published. I was with you until Step 3. Why would penetration down below thermosphere altitudes of the the high-energy radiation currently responsible, I’m told, for the “radiative super heating” no longer be suppressed by absorption in the (near-vacuum) thermosphere? Also, could you please answer Mr. Eschenbach’s question, Cooler than what? That is, you seem to be saying that the radiative gases have a net cooling effect, but presumably you’re not saying that at the end of the day the atmosphere would in their absence disappear–and that as a result the earth’s surface temperature would on average be warmer than now. So what is the ultimate state of the atmosphere in your scenario in which the average surface temperature would be warmer? seems to me the “average” earth temperature would be nearly the same with or without an atmosphere…just with wild swings daily but on average nearly the same? as in high of 80 and low of 50 averages to 65, high of 200 and lows of minus 70, still average out to 65….the atmosphere SLOWS the process eliminating the wild swings but NOT altering the total input/output of energy…….to make the system warmer REQUIRES more heat energy in total in the system, and the atmosphere doesnt do that. using a thought experiment, the “Steel Greenhouse” as a means of verifying an hypothesis, the so called “GHE”!? You could not possibly transit further from the principle of “science”. An hypothesis requires empirical observation for verification. When you use a thought experiment, where none of the main parameters are replicable, i.e. it is not possible to place a steel shell around a planet, in place of empirical observation, you are using a circular argument. A standard logical fallacy. The flaw with the “Steel Greenhouse” thought is experiment is simple enough to unravel. You cannot add 235 w/m2 to 235 w/m2 and come up with 470 w/m2. There is no increase in energy flux density so therefore there is no increase in temperature and thus no further increase in w/m2 above the original 235 w/m2. Two ice cubes both radiating at 314.94 w/m2 cannot produce 629.88 w/m2 and melt each other. If you add one ice cube radiating at 314.94 w/m2 next to another ice cube radiating at 314.94 w/m2 you still only have 314.94 w/m2, QED. my example was NOT a “constant uniform temperature”………wouldnt the same 4th power apply with or without an atmosphere? also the earth is NOT a black body. Thanks for that correct analysis of the effect of the 40 W/m2 “atmospheric window”, Wayne. Curiously, rather than the radiation density being “far too high” as you say, it’s not high enough. The problem is the balance at the surface. The average upwelling surface radiation is 390 W/m2. However, the surface also loses energy through both sensible and latent heat transport from the surface to the atmosphere. These total on the order of 100 W/m2. That means that the surface is losing energy at the rate of about 490 W/m2 … and a perfect steel greenhouse only produces 450 W/m2 at the surface. So the problem is not too much energy … it’s too little energy to match the condition of the earth. … The flaw with the “Steel Greenhouse” thought is experiment is simple enough to unravel. So you’re saying that if I have a heater putting out a thousand watts per square metre pointed at an object, and then I add another heater of the same thousand W/m2 … your claim is that the object won’t warm any further because 1000 W/m2 + 1000 W/m2 = 1000 W/m2? Because if so, my friend, you are beyond my poor ability to assist. Let me recommend the excellent post by ScienceOfDoom, which goes into the question in some detail. Hi Willis. Yes, I was just using a single slab viewpoint and I also have found that the 70 W/m² from TFK is too low, you can never seem to get a balance with that value. I have broken your example into twenty to one hundred shells and on both Earth and Venus and you get some very interesting results. With a two slab model you can get some variance in what the ‘window’ radiation value is depending on at what average altitude those slabs represent. I have come up with, more than once, that it is close to 78-81 W/m² but once again that depends on the definitions of where the slabs are vertically and how many layers. Willis, from your diagram I hope I’m interpreting you corrrect when you said “it is too low”. If you take your ‘shell’ viewpoint and instead of tracking through distance which brings in lapse rates, varying pressure and density with altitude (distance) and all of the complexities they contain and instead break your ‘shells’ or layers into even and equal mass layers (really just even pressure breaks) on even other bodies it becomes so easy to get a relation all of the way from the surface to space and it is quite surprising. For really optical depth has absorbing mass at it’s core. You can configure the equations as distance and concentration or more simply just configure it as absorbing mass passed through and the later is much simpler. All of this stems from your “steel shelled planet” discussion and I must refrain going much deeper here for Dr. Brown is looking at that aspect right now on what this all seems to lead to. It the current debate about CO2, the whole atmosphere being poorly radiative is a theoretical problem only, as we would need to lose all oceans before this could ever happen. However as to theoretical radiative super heating of stagnant N2 and O2 in poorly radiative atmosphere, it is important to note that UV penetrates the full depth of our atmosphere and many meters into the oceans. Willis’ question “cooler than what” is a fair question. The presence of liquid water on the planet makes this difficult. One cannot compare an “earth with atmosphere” to an “earth without an atmosphere”. Cloud albedo issues aside, without the pressure of an atmosphere the earth could not retain liquid oceans, nor could those oceans evaporatively cool. One way to examine the role of non-condencing radiative gases in our atmosphere is to model their role in the atmosphere of a theoretical desert planet and ignoring solar wind and assuming diurnal cycle. Coldest – Thin atmosphere with radiative gases. Cold – Thin atmosphere without radiative gases. Warm – Thick atmosphere with radiative gases. Hottest – Thick atmosphere without radiative gases. Again I will state that there is a slight radiative greenhouse effect, but the net effect of radiative gases in our atmosphere is cooling. Again, a planet in radiative equilibrium can have very different atmospheric temperatures depending on the energy flows, both radiative and mechanical, within the atmosphere. 3. Emitting downwelling IR slowing the cooling of the land surface in conductive contact with the lower atmosphere. 1. Radiating more than double the energy to space from the upper atmosphere than the combined net flux into the atmosphere from surface radiation and the incoming solar radiation directly intercepted by the atmosphere. 2. By cooling the upper atmosphere, radiative gases allow air mass subsidence, critical to tropospheric convective circulation. This strong vertical circulation across the pressure gradient of the atmosphere produces the observed lapse rate, lowering average tropospheric temperatures. 3. Tropospheric convective circulation so produced, acts to transport energy acquired from conduction and evaporation away from the surface. The “basic physics” of the “settled science” of the original claims, modelled only the change in radiative exchange between surface and atmosphere for increasing radiative gases without simultaneously modelling the increased speed of tropospheric convective circulation that would result. They only modelled half the problem, and as the experiment I posted earlier with liquid water and incident IR shows, they even got that half wrong. The “settled physics” remains so until unsettled by a better one, which in this case remains to be seen. What is a “radiative gas” if not a substance that absorbs electromagnetic radiation at various frequencies determined by its molecular and atomic structure, for example oxygen and nitrogen in the UV range, water vapour and CO2 in the IR range. And by absorbing energy it gets warmed up. It is tricky since the thermal forcing described as the cause of AGW is relatively tiny: for all gases confounded it is about 2.45 W m-2 as published by Myhre  since the beginning of the industrial era. It is only 0,7% of the average incoming sunlight of 341.5 W m-2 And any doubling of the CO2 concentration would cause a forcing of 3.7 w m-2, or 1.1% of the total (in comparison, the rainfalls that involve latent heat of vaporisation are accounting for approx 60 W m-2). Are the experiments that you mention capable to grasp these quantities? This forcing is small but is alleged to be relevant in the warming of the atmosphere: that’s where dissent begins between catastrophists, skeptics and heretics, in the size of its impact after taking into account feedbacks, not in the nature of the phenomenon. Absolutely not. The ‘shell’ only has the ‘total’ energy radiated from the planet’s ‘surface’. Thus, with ‘twice’ the ‘area’, can only radiate energy at ‘half’ the ‘W/m^2’ ‘energy/area, or power/area, flow rate’ supplied by the planet’s surface W/m^2 when in a thermodynamic ‘steady state’. IMHO you seem to have confused a dynamic with a potential. Back-radiation increases the ‘potential’ (temperature, or energy density), but the rate of ‘total energy flow’ is constant, and equal, for both the shell’s and the planet’s ‘total surface areas’ when at steady state. To propose that the outgoing W/m^2 is the same from the planet’s surface, as from the shell’s surface, is to propose a ‘perpetual refrigeration device’ for the space between planet and shell. It’s just impossible. I think I’ve ‘talked this one to death’ elsewhere, and I’m unsure of its validity as thread content here. Willis – a heater is a heat source. A reflector is not. Am I missing something? A black body surface at 15 °C (288 K) emits 390.1 W m-2 with peak wavelength at 10.06 μm. One degree higher at 16°C (289 K) it is 395.6 W m-2 with peak wavelength at 10.03 μm. This is why small forcings matter. “One way to examine the role of non-condencing radiative gases in our atmosphere is to model their role in the atmosphere of a theoretical desert planet and ignoring solar wind and assuming diurnal cycle. “Coldest – Thin atmosphere with radiative gases. “Cold – Thin atmosphere without radiative gases. “Warm – Thick atmosphere with radiative gases. I now think I understand what it is that you believe. I think you’re wrong, but, since you appear to believe it strongly and I’m no physicist, I won’t attempt to persuade you otherwise. Still, I appreciate your giving a straight answer, which is a sometime thing. Once again my reply to Willis has vanished into the ether. It depends Willis. If you are in a vacuum, add as many heaters as you like. If you are not in a vacuum, then because you have just added a second separate heat source generating another 1000 W/m2, then you have two separate energy sources both with temperatures of 364.4 K. So you can add more heat and increase radiation because you have increased kinetic energy. But this is not the same as adding radiation together. You cannot add radiation together and get more heat. Remember the ice cube analogy I posted earlier Willis. That’s two ice cubes and therefore two lots of 314.94 W/m2 and yet no increase in temperature. Add as many ice cubes radiating 314.94 W/m2 as you like Willis, you know you won’t get more than 273 K.
If you were correct, which you are not, then ice would melt ice and there would be no such thing as ice. In-fact the only thing that would exist would be pure energy. Keep off the “Science of Doom” wacky-backy Willis, it won’t help you understand reality. All true, but only half the picture. A radiative gas also emits IR. At the top of the troposphere radiative gases are emitting to space not just energy the atmosphere acquired by intercepting radiation, but energy acquired by surface conduction and release of latent heat from condensing water vapour. It is this radiative energy loss from the upper atmosphere that allows subsidence of air masses in the Hadley, Ferrel and Polar tropospheric convection cells. Radiative gas concentration therefore plays a critical role in governing the speed of tropospheric circulation, and thereby the strength of mechanical energy transport away from the land and oceans. Arrhenius made the mistake of not modelling this in 1896, and little has improved. You cannot use just SB equations to calculate changes in atmospheric temperatures for increasing radiative gases. Fluid dynamics is also required. The simplest way to demonstrate this is via empirical experiment. It’s simple to run. Just two 1m tall EPS foam boxes penetrated by thin aluminium heating and cooling tubes. 90C hot water run at the same flow rate through the heating tubes in each box and 1C water at the same flow rate through the cooling tubes of each box. Q. Which box best represents an atmosphere with radiative gases and which a non radiative atmosphere? Q. Which box will have the higher average gas temperature and why? Q. Without adjusting water flow rates, how do you make the two boxes run at the same average gas temperature? Of course by emitting in the IR range the substance will lose energy and in absence of other heat transfers (adiabatic conditions) will have its temperature declining.The major player here is water, the next one is CO2. In your experience heat exchange is maintained with the exterior (running water in the coils). This is not the condition of the planet where the only heat sink is the outer space. Both boxes contain the same gases, “radiative” as you call or not. The final temperature will be driven by the running water exhanged with the air by conduction, convection and may be a little bit of radiation across the coil as long as there remains a driving force, a temperature gradient; any heat quantity is provided from outside the box. By the way, if the air in the box is saturated with water vapour the coil at 1 ℃ will cover itself with condensate the latent heat of which will be evacuated by the circulating water. What apparently you don’t want to get is that the 2.45 W m-2 since the beginning of industrial age or the 3.7 W m-2 for a doubling of CO2 concentration relate to this IR absorbing phenomenon (a logarithmic concentration dependency), and are significant to the warming story where fractions of degrees are discussed. IPCC now tells 1.5 to 4 ℃ on the basis of invalid or partial modelling, not on the basis of wrong fundamental phenomena. The magnitude of that significance and the subsequent impact on the climate on our living conditions is the heart of the debate. And, at the cost of repeating myself, not the existence of the phenomenon. If you believe radiation plays any significant role in the experiment or the results can be confounded by any discussion of it then you simply don not understand the experiment. The experiment results are determined by Raleigh/Bernard circulation and conduction only. The experiment is a simple demonstration of the truth of that statement, designed so other readers can simply replicate it and confirm the results. (You know, the scientific method). The experiment when run for a period will result in both gas columns reaching an equilibrium state, with virtually the same energy entering and exiting each gas column. However the average gas temperature at this point will be higher in one column than the other. This is the direct result of the only difference between the two gas column, the height that energy is entering and exiting the gas column. Once again, can you tell which gas column reaches the higher average temperature and why? You can imagine each column full of dry nitrogen if it helps. – I would again say no, the “narrative” is collapsing and the is no longer any hope of controlling or framing the debate. I am aware that there are desperate attempts to find an exit strategy for all the activists, pseudo scientists, journalists and politician now hopelessly compromised, not just by their AGW advocacy, but by their shameless vilification of sceptics. However “there is some warming but less than we thought because (insert “sciencey” sounding excuse here)”, won’t wash. In fact it just makes things worse. The net effect of radiative gases in our atmosphere is cooling at all concentrations above 0.0ppm. Avoiding admitting this is just holding scientific advancement back for sort term political expediency. Trying to engineer a “soft landing” for the fellow travellers is just adding to the permanent Internet record of wrong doing in this shameful assault on science and democracy. The developing world is facing real pollution problems on a scale the developed world has never seen. Keeping AGW alive is destroying the last remaining credibility of environmental science and the environmental movement at a time when the planet can least afford it. Do the public careers of a few activists, journalists and politicians really matter in comparison?